As the Beatles say, you get by with a little help from your friends. So, the blog is getting by with a little help from its friends today, too (see the previous post). Urban Daddy just sent me a missive about very old British pants and I knew it belonged over here. While many styles for women in the last year have veered towards moo-moo, men now have their tent-inspired item, as well! 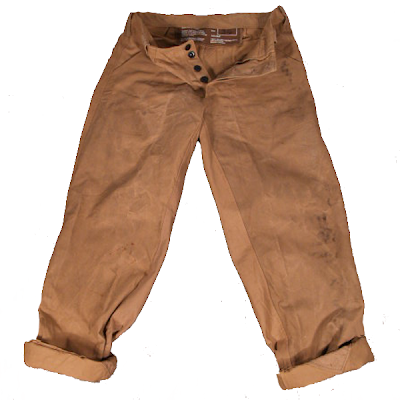 These Stabo Bivvy Trousers are made from real World War II era Bivouac tents. (I love the label and the button fly). I love your blog.. was surfing the net in search for antique furniture and was led to your blog. This is a gem of a blog. I'm a huge antique fanatic so basically, anything old and fashionable in its time puts a smile on my face. It is obvious enough to see that bivvy trousers are different from other brands. The fabric used was designed for extra durability as well as being lightweight for convenience in use. The color is also unique and offers a wide range of options for the customers. You can touch and feel the fine texture for yourself; to see how it exudes quality. These snicker work trousers can be used for leisure or for work. wonderful selection... I love these kind of trousers... perfect to hide my rife kilos with a little of style! Wonderful your choice because The fabric used was designed for extra durability as well as being lightweight for convenience in use. The color is also unique and offers a wide range of options for the customers. thanks a lot for your valuable sharing ,right from the beginning till end it was really very informative .i can witness the experience and steps you have taken to accomplish this wonderful work.